Colin Hayes AM. O.B.E. (David's father) commenced his training career in 1947 in Adelaide and won his first Adelaide Trainers' Premiership in 1955-56 from his 'Surefoot Lodge' stables (named after his first horse) at Semaphore in South Australia. Inspired after a trip to the UK where he experienced horses trained in a country environment, Colin established Lindsay Park Racing Stable and Stud amongst the magnificent red gums and rolling hills of Barossa Valley, South Australia in 1965. This was a visionary move to take horses away from the traditional training circuit of the city track. But with intuition and a masterful plan, Colin Hayes developed a world-class training complex that today draws accolades from industry experts the world over. An ideal equine environment for breeding and training, it was the foundation of his success and now for the future success of son David. Colin Hayes loved horses. In a 43 year career he trained 5,333 winners including 524 Group or Listed winners. His wins included two Melbourne Cups, four VRC Derbys, three Cox Plates, three Australian Cups, three Blue Diamonds, four Newmarket Handicaps, one Caulfield Cup, one Sydney Cup and the Golden Slipper Stakes. 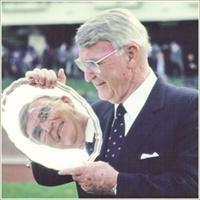 He established Lindsay Park as a dominant force in Australian racing and breeding for decades. As well as Australia's premier private training facility, Colin also conducted his successful breeding operation from the Angaston property. Lindsay Park Stud became home to some of Australia’s most influential stallions including Without Fear, Zabeel, At Talaq, Jeune and Rory’s Jester. Colin had a strong passion for breeding and together with Robert Sangster, he initiated the shuttle stallion into Australia. 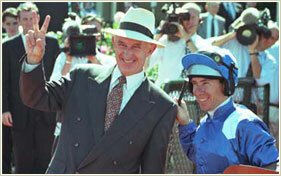 Colin Hayes retired from training in 1990 and was inducted into the Australian Racing Hall of Fame in 2001. Taking over where his dad left off, David Hayes launched his training career with a tirade of winners. Not only did he take Lindsay Park to further heights, but also to the world. David won the Melbourne and Adelaide Trainers Premierships in each of his first five seasons before accepting an invitation to train in Hong Kong from 1996, which he did successfully for nine seasons. Read more about David's career by clicking here. While David was in Hong Kong, his older brother Peter was handed the reins of Lindsay Park. 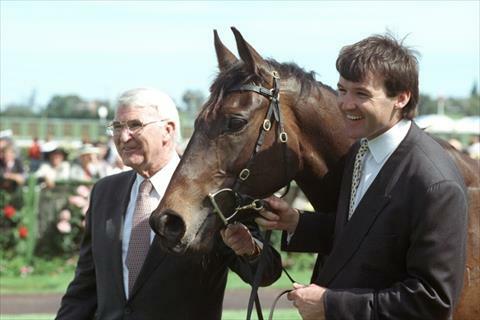 Under Peter’s care the winning momentum continued with Lindsay Park taking four Melbourne Premierships and five Adelaide Premierships until his tragic death in 2001. Long time assistant trainer Tony McEvoy immediately stepped in to train, and took Lindsay Park to a further three Adelaide Premierships and one Melbourne Premiership prior to David returning from Hong Kong in 2005. 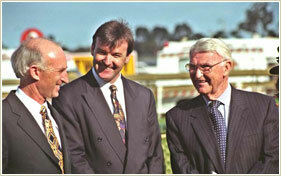 With David at the helm, the stable was immediately brought back to the top of Australian Racing. In 2006-07 David's horses won a staggering 11 Group One races and in excess of AUD$19,000,000 in prize money. He won the Melbourne and Adelaide Trainers Premierships in both 2006-07 and 2007-08. The Hayes family motto is 'The future belongs to those who plan for it'. Shortly after returning from Hong Kong, David and Prue Hayes made a plan for the future of Lindsay Park. The first part of the plan involved divesting of the breeding interests to allow David to focus his attention on the training of the racehorses. This was achieved in 2008 when David sold his share of Lindsay Park Stud to his nephew Sam Hayes and business partners. The next part of the plan involved reducing the horse numbers and centralising of operations at a new purpose built facility in Victoria, hence the development of the Lindsay Park Euroa property. The new property has been modelled on Lindsay Park, Angaston and designed to take advantage of the country environment that has been key to the success of Lindsay Park in the past, but with all of the modern technologies and features not available at metropolitan racetracks. The location of the property at Euroa allows us to focus on Victorian racing and at the same time being within easy reach of Adelaide and Sydney Metropolitan Racing.